You’re The BEST Advocate for Your Credit Union! Plus, you are the one person in the whole world who really-truly understands what it’s like to live your life and how being a Credit Union Member makes it better. And we’re not just talking about the friendly smiles and the free coffee. (Those are pretty awesome, though.) We’re talking about the feeling of investing your money in a local, cooperatively owned Credit Union and knowing that means your neighbors can borrow the money they need, when they need it. PLUS, we’re talking about how Credit Unions all over Wisconsin, the USA, and the globe can provide the amazing benefits of being a part of the Credit Union family because our members believe in us. So yeah, being a Member, knowing that we’re here to help, and letting your voice be heard by the lawmakers that represent you makes YOU the best advocate for what we do. We believe protecting the privacy and security of your accounts is one of the most important things we can do and we need your help to make sure the places you spend your hard earned money do the same. When we're alerted of a data breach at a retailer - like the ones that have made national headlines at Target, Home Depot, Best Buy, or Sears - we take action immediately. We contact the affected members, work with them to change account numbers, and issue new credit and debit cards to keep their money safe. In many cases, we can't even say which merchant caused the breach even though we're the ones working to protect your account from the fraud. The current system is broken and needs to be fixed. That’s why we need your help! 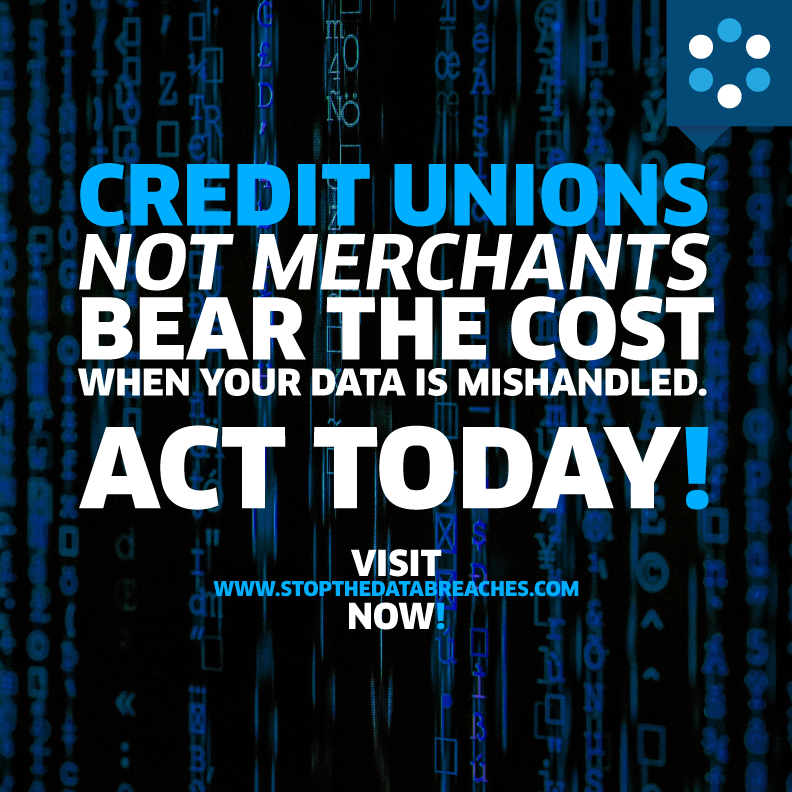 Reach out to Congress and tell them to Stop the Data Breaches! What do you mean by 'Advocate for Your Credit Union'? Yes! Right. Here’s the quick low-down. Credit Unions (Banks and some other lenders too) are pretty heavily regulated to make sure we’re all doing the right things. For example, we have to make sure that if we’re going to charge you interest on a loan, we tell you what it is and there are no scary surprises. A lot of the regulations are pretty common sense like that, and we follow them because that’s our job. What can happen, though, is that lawmakers decide to add or change one of the regulations we have to follow in a way that doesn’t make sense for everyone. For example: some newer regulations in the Mortgage world mean so much more paperwork and red tape that a small credit union has to hire more people just to keep up. A big employer, like a national Bank, might be able to easily add the person power to while hometown Credit Union with a tight budget can’t. To follow the regulations and avoid a hefty fine, that little Credit Union may have to raise fees or cut member benefits to make it work long term. We’re not going to lie, some of our ‘Financial Cousins’ like the big national Banks, have pretty deep pockets so they can pay full time lobbyists to be there in Madison and Washington D.C. where the lawmakers hang out. Those lobbyists spend a ton of time – and money – to make sure the laws favor the people they work for. In the Credit Union movement, our pockets are … well, your pockets. Our members own us and we’re not-for-profit. That means that when we’re spending money, we’re spending YOUR money, and we have to make sure we’re investing it in things that help you now, right? Instead of a huge team of high-paid lobbyists Credit Unions work together with our members to make sure your money is protected, and your voice is heard. Sure! There’s a lot in it for you, but let’s be really honest and talk money. 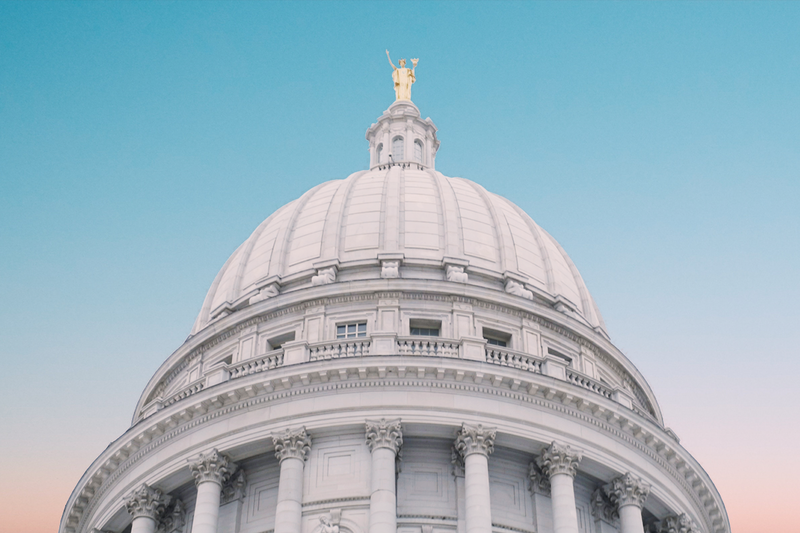 According to a study published by The Credit Union National Association (CUNA), unnecessary regulations cost Wisconsin Credit Union members an average of $116 each. No, it’s not a TON of money, but it does come out to a total of $167 Million in our state alone, and that’s a lot of money that could be back in our communities – and your pockets – to make the world better, right? So, by spending a little time to advocate for common sense regulations, you stand to save $116 for every Credit Union member in your household. It adds up, right? How is the Credit Union team advocating for us? Fair. If we’re going to ask you to talk the talk, we better be right there with you. At Simplicity CU we believe that advocacy is a vital part of what we do. Those are nice words, right? How about we back them up? We’re a part of a group of Credit Unions across the USA that work with CUNA to make sure our members know what lawmakers are doing about regulation changes that would affect us all. We’re trying to get the tools in your hands to reach your representatives and tell them how you feel. Tools like CommonSenseRegulations.com where you can learn more, take action, and share your own story. We also make sure to show up at events like the State and National Government Affairs Conferences every year. There we can get in the room with the lawmakers, talk to them like people (which they are), and help them understand what you need to be a happy, healthy Credit Union member. I'm ready! What can I do to help? Jump over to www.commonsenseregulations.com where you’ll find handy links to help you reach out to your lawmakers on all of the most current CU Advocacy issues. Follow Simplicity CU and CUNA on social media to stay in-the-know and share the issues that matter to you most with your friends and family. Be smart. Be Loud. Never stop. Let’s make a deal, ok? Now that you’ve found our Advocacy page, keep it in mind. Whenever there’s something we think you’ll want to know it’ll live on this page so you can always check back in and see what’s up. You can also keep reading below and see some of the really, truly awesome things Credit Unions and their members have accomplished together. Spoilers: It’s gone on a lot longer than you realize!